Hydro Tech performed a comprehensive Remedial Investigation at the site including installation and sampling of six soil borings, three groundwater monitoring wells and four soil vapor implants. The results of the investigation indicated the presence of impacted historical fill material throughout the site extending from the surface to a depth of six to eight feet below grade. The results further indicated the presence of petroleum and chlorinated volatile organic compounds in the soil vapor beneath the site. The developer enrolled the site in the New York City Voluntary Cleanup Program and a Remedial Action Work Plan was prepared and approved by the New York City Mayors Office of Environmental Remediation (NYCOER). The work plan included a certified vapor barrier and composite cover design as well as detailed health/safety and community plans to ensure the protection of remedial workers, community members and future occupants. Hydro Tech supervised the removal and disposal of impacted fill material, the installation of a vapor barrier and composite cover system and executed a community air monitoring program during invasive work. 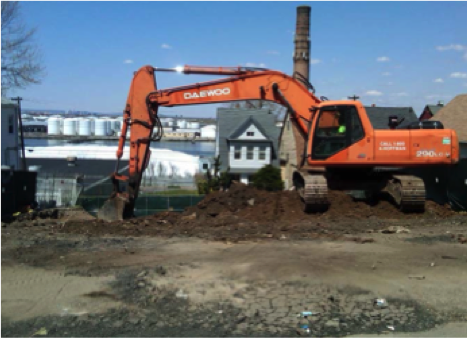 The Site achieved Track 1 Unrestricted Soil Cleanup Objectives, the most stringent cleanup criteria, and received the Big Apple Brownfield Award for its implementation of significant sustainable remedial practices.